COUNT ON US… AND STAY IN FRONT OF THE CAMERA. It may have been a frugal budget, but for us, it was another fruitful February. …MIRACLES JUST TAKE A BIT LONGER. They were never going to be early. But now the rush is on. The A.P. Arrows are winning with daylight to spare. 1st - Coby by 1.5 lenghts for Gary Alexander. Now SA Oaks (Grade 1) bound. 1st - True Arrogance by 4.75 lengths for Gavin van Zyl. 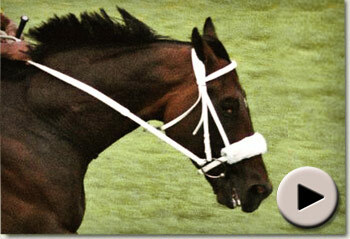 SA Derby (Grade 1) prospect. 1st - Nondweni’s Filly for Stuart Pettigrew. The performance by the raiding Gary Alexander stable’s Classic Illusion to win the Grade 3 Flamboyant Stakes over 1600m was the highlight of racing at Greyville on Friday evening. S’manga Khumalo rode a copybook race on the popular mare. Only eleven ladies lined up to contest the feature after Lady Tatty was withdrawn prior to the start for reason that she was not striding out. The longshot Chestnut Model was quickly out and she led a rush with Keagan De Melo getting Danseuse across from her wide post to run handily. Kevin Shea did not enjoy a cheery evening at the office and his mount Orange Blossom was checked and forced wide at about the 1200m marker. This put paid to whatever winning chance she had. Going around the bend Chestnut Model led Danseuse and Flitter, with Classic Illusion tucked in comfortably about five lengths off. Into the home run Chestnut Model continued to lead but it was apparent that Khumalo knew what he had under him and he switched Classic Illusion out for a clear run to the line. With only Murmering Sky in sight, Classic Illusion galloped powerfully and won going away by 2 lengths in a time of 96,64 secs. Murmering Sky ran on well for second, just ahead of the luckless Orange Blossom, with Blouberg Beach making good ground for fourth. Classic Illusion, owned by Jo and Bruce Gardner, Myron Berzack, Kirk Michael and Greg Sadie, was bred by Summerhill Stud and is by Kahal out of Arthur and Vynette van der Heijden’s Jallad mare, Class Will Sell. 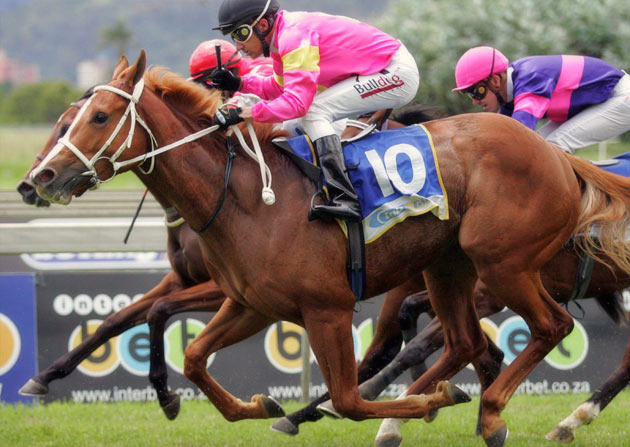 A R200,000 National Yearling Sale graduate, Classic Illusion has now won 5 races with 10 places from 27 starts and took her earnings to R466,325. THREE STAKES WINNERS, TWO WEEKS, ONE FARM. 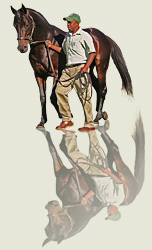 Last February we staged the inaugural Summer Ready To Run Sale at Summerhill. So far, there’s been a raft of winners, and they just keep rolling in. "L" IS FOR LEADER : LAFFERTY, LAIRD AND "LJ"
and the cheques were scarcely dry. And it’s well worth singing. We have a real old pal who’s ailing a bit at the moment, and can do with a tonic. Our relationship with Robert and Robin Muir goes back to Pat Goss’ Durban July celebration party in 1946, when the smallest horse in history, St Pauls, rolled his field in record time. Robin’s mother was the hostess at the Kew Hotel, for a victory party that raged for two days, and the fact the Muirs are patrons of Summerhill 65 years later, is testimony to the value of good friends. On Thursday, our mutually owned seven-year-old gelding, Vangelis, came home for the 13th time in his career, pushing his earnings ever closer to the million Rand mark. After five consecutive third places, this was a welcome turnaround and a compliment to the skills of his trainer, Gavin Smith. There’s a tale attached to Vangelis however, as there is to most good horses. The day he was born, our Foalcare manager, T.K.Nkabinde, proclaimed him a “Derby winner”, and while you may say there have been many of those stories and that he didn’t win the Derby, he’s given us just as much pleasure as one which did. Long before he was weaned, Vangelis came up with a lame shoulder that plagued him for two years of his life, and we wondered whether he’d ever reach the racecourse. That he did, and he did it well, writing his record in black and white. His history of injury though, made him a difficult sell, and it took us close to his third year (he was still on the farm at that stage) to place him. Robert Muir was on safari in South Africa, and he took a couple days out to show his friends Summerhill and the delights of Hartford House. On a typically fresh autumnal morning, he and his mates accompanied us to the track to watch some horses work, when Vangelis and a bright chestnut with a white blaze, by the name of Imbongi, worked together. They were equally impressive, and Robert indicated he’d like to invest in both. Before he reached Durban on his return journey, he phoned to say that one of his advisors had suggested he leave the Russian Revival horse out of the package, and wondered if that would be in order. Of course it would be; we had no end of faith in Imbongi, and it wouldn’t be long before he was placed as well with another mate, erstwhile Jockey Club chair and ambassador extraordinaire, Ronnie Napier. You now know Vangelis’ record, but it’s worth recording that Imbongi went on to become South Africa’s Champion Three-Year-Old Miler, he was a Group winner in the UK, and the victor ludorum at the Dubai Racing Carnival in 2010. His earnings stood beyond R8million at the point of his retirement last month. There’s an adage in all of this. The likes of Emperor Napoleon, Bold Ellinore and Amphitheatre are a few more of those who were left behind on the farm after the sales, as was this week’s big hero, Black Wing. Who knows what bargains are lurking on our tracks as we write? Last week Midnight Serenade went to the top of the Juvenile rankings in the Storm Bird Stakes. A week before, Maji Moto doubled up in great style. And this week Malhub’s Oil Tycoon waltzed to his 3rd consecutive win for Ormond Ferraris while Onehundredacrewood blitzed the field in the Bauhinia Handicap. BUT HE’S MAKING A MEAL OF IT. It rained cats and dogs before the sports began at Turffontein Tuesday evening, and the turf came up sticky. This was a bit of a worry for the contestants in the Bauhinia Handicap (Listed) a “scorcher” at the minimum trip for fillies, and an event fabled for the production of some distinguished broodmares of the past. Tuesday night, Summerhill looked to have a pretty good hand, but with the going coming up as it did, there was no knowing what the outcome would be. There was some relatively unexposed form in the race, and nobody knew just how good the visiting opposition were, particularly the two Mogok fillies, Candy Tuft and Essential Oil, the former of whom had shown impressive form on two occasions behind the Group One winner, Noble Heir. In the end, it was an all Summerhill affair, Onehundredacrewood making up stashes of ground from the back of the field on the stand-side, to run down her erstwhile paddock mate, Mannequin, in the dying strides, and win going away by a length in 57,8 secs, remarkable for the “soft ground”. Mannequin is already a Feature race winner this season, but this was the first Black type victory for the daughter of Malhub, whose progeny were posting their second stakes win in nine days, following Midnight Serenade’s win in the Storm Bird Stakes weekend before last. Michael Azzie has in his care a Kahal half brother to the heroine, by the name of Emperor Augustus, whom we rated highly among the horses we consigned to the 2009 version of the Emperors Palace Ready To Run Sale, whilst last year, the next Kahal sister was snapped up by long-time customer, Paul Calderia. No doubt, both of these fellows will be rubbing their hands knowing they acquired two horses we considered ahead of Onehundredacrewood at the same stage. For the Jallad mare Roman Dream, this could be the beginning of an odyssey. but the present Malhub Juveniles are a class apart. There are still a handful of his best at Summerhill. 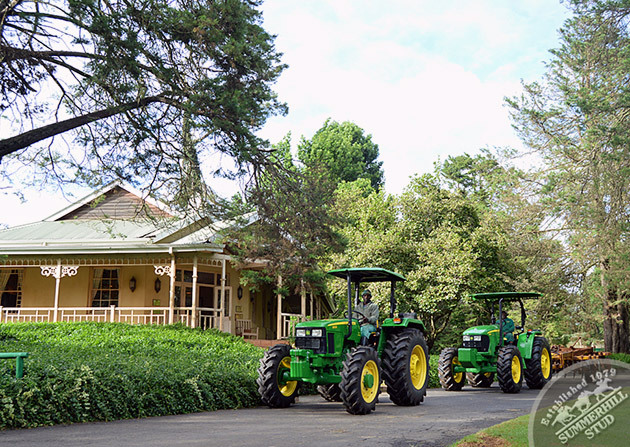 When Mike de Kock tipped his progeny at the Ready To Run gallops, Solskjaer must have been listening. Named for the man that won the European Champions Cup for Manchester United, Ole Gunnar Solskjaer, our man came to Summerhill as the most accomplished son of one of the world’s best stallions, Danehill, to set foot on continental Africa. It was always going to take a little time for the “Sollys” to come to hand, given his pedigree and the fact he’s a brother to the immortal stayer, Yeats, and if Ice Axe’s 4.75 length romp on debut Sunday was anything to go by, he’s announced his arrival in no uncertain terms. A half brother to the Champion filly, Icy Air, this fellow was a December foal, of whom little could’ve been expected ‘til now. But they’ll be waiting for him from here on hence, especially as he’s bred to get at least 2000m, and you’d have to believe he could move up on his weekend performance on this evidence. It’s been a hot weekend for Ingrid and Markus Jooste, Charles Laird and their Summerhill Ready To Run graduates. At Turffontein on Saturday, Hollywoodboulevard, (a R900,000 daughter of Street Cry) made it four in a row in the Three Troikas (Grade 3), “Figgy’s” hands-and-heels ride carrying her to the top of the Gauteng sophomore fillies’ class. Remember, she has a parallel line of form through her erstwhile Summerhill paddock mate, Igugu, to the Cape champion, Ebony Flyer, which puts her right up in that bracket. Racing fans have something to savour in the KZN winter season’s clashes between these three exceptional young ladies, who may even be better than their male counterparts. 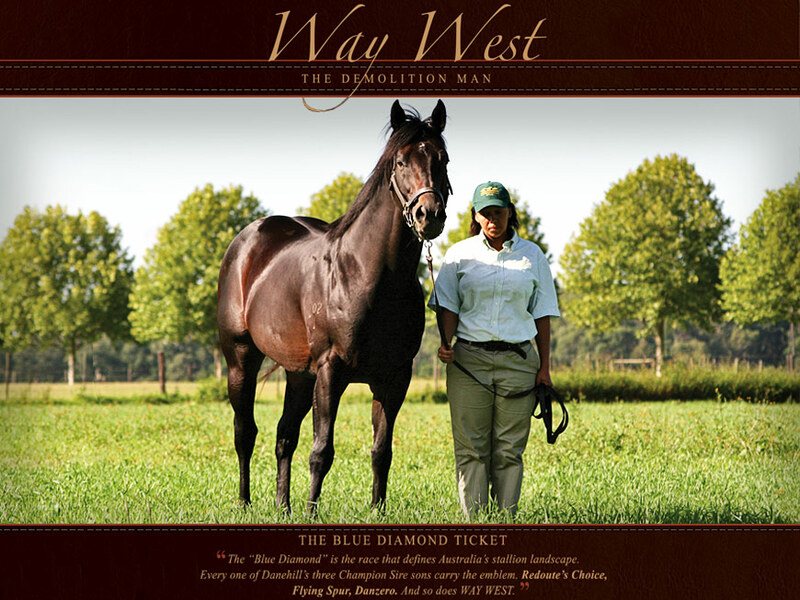 Second leading sire of Stakes winners this season. IF WE WERE GOING TO WAR, HE’D BE OUR GENERAL. He already has a Highveld Champion in his first crop. This week, three more runners, every one in the money. While Americans celebrated their Independence day, their neighbors to the north also enjoyed a grand celebration with Sunday’s 151st running of the Queen’s Plate at Woodbine, the oldest Thoroughbred horse race in North America. Moved back in the calendar this year to accommodate the royal visit of Her Majesty Queen Elizabeth II and Prince Phillip, the first race of the Canadian Triple Crown was won in hard-fought fashion by Big Red Mike (Tenpins), from Hotep (A.P. Indy) and Roan Inish (Elusive Quality). Big Red Mike kicked off his career with a second place finish sprinting over Woodbine’s main track in November before getting the job done next time out 6 December. Making his seasonal debut over seven panels on 11 April, the robust chestnut showed good early speed and came up 3/4 of a length short of the victory. Asked to go past a mile for the first time against allowance company on 2 May, Big Red Mike had to settle for third, but rebounded in his latest to collect a narrow victory in the nine-furlong Plate Trial Stakes against fellow Canadian-breds on 13 June. Given a 5-1 chance for the big dance, Big Red Mike quickly rushed up to take command and lead Hotep through opening splits of 0:24.43, 0:49.39 and 1:14.31. Maintaining his pursuer comfortably at bay turning for home, Big Red Mike dug deep and proved best with a game performance over the Sam-Son Farm runner.The sole filly in the field, Roan Inish, closed well for third. “I should have realised I wouldn’t beat the blog to the “HEAR THE DRUMS” and “PIERRE JOURDAN” stories but still, what a couple of days for Summerhill! 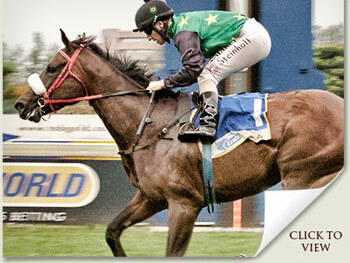 Apart from them, my eagle eye has spotted several other Summerhill-bred winners which deserve mention. mention “IMBONGI” in Dubai. Jolly good show! I have previously enquired how Summerhill manages to produce horses like the Fabricius and Alexander champions on what appears to me to be the only visits by a Summerhill mare to, respectively, “GOLD PRESS” and “PARADE LEADER”, unless, of course, you bought the mares in foal”. End of quote. Editors note : It’s no coincidence, or at least that’s the way we see it, that Summerhill has also raised some of the best runners by other “outside” stallions, (notably ten-time winner and triple Group One performer, Fanyana, by Alami, and Group One performer, Thandolwami by Woodborough) which tells us what we’re doing on the farm is a significant contributor to the outcomes we’re seeing at the races. Summerhill’s commanding lead in the Breeder’s log at present has only a little to do with genetics, and a whole lot to do with the way we farm, the way we feed, the quality of our people and the environment in which we operate. We have constantly pushed the envelope in our search to find new and better ways of doing things, and the more we push, the more we find ourselves getting away from the old British methods our forefathers employed as a matter of habit, as we embrace the attributes of this great continent, and more specifically, our own area.